I still have not figured out a really cute way to picture cookies. I am not sure what my problem is but the picture never comes out right so I decided this time around to show you the cookies in my new cookie jar. This is the new OXO 5 qt cookie jar that I bought a couple of weeks ago and I love it. I would just put the cookies in some Tupperware and the cookies never stayed fresh so I knew I had to get something that was airtight especially since we seem to always get a small ant infestation once a year as well and would not want to see ants on my cookies.This jar keeps the cookies fresh, I tested it last week with a batch of chocolate chip cheesecake cookies (sorry no pictures) and I don't think I will ever see any ants so I am very happy with my purchase. This time around I decided on making some Orange Creamsicle Cookies that taste exactly like orange creamsicle ice cream. These are light and moist and slightly sweet, exactly what I expect out of a cookie. 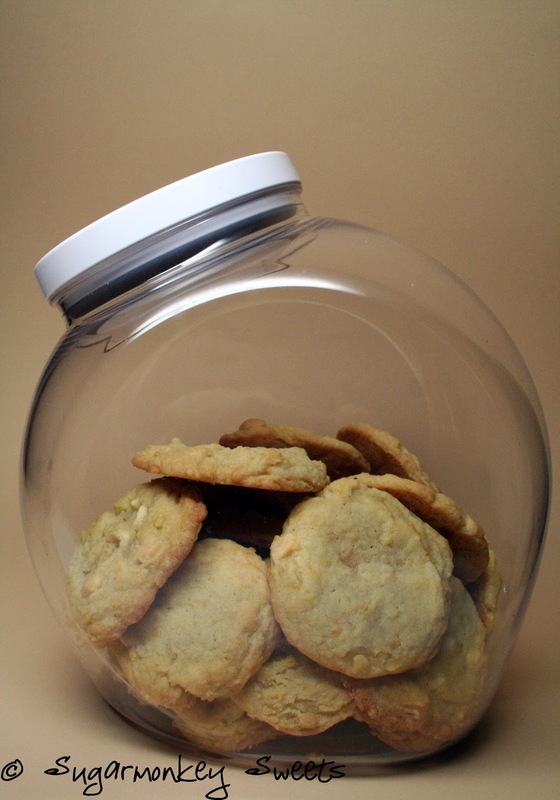 I don't like hard cookies at all (another bonus of this cookie jar is that the cookies do not get hard, LOVE IT!). I found this recipe over at Sprinkled with Flour which came from The Magnolia Bakery Cookbook. I will let you click over there for the recipe. I will work on getting better cookie pictures and baking more sweets for you soon. I love strawberries. I mean I really, REALLY love strawberries. Strawberries and whip cream, strawberries and chocolate, strawberry milkshakes, strawberry ice cream, strawberry coke floats. I don't care, as long as it has a nice natural strawberry flavor and I can have all of it. Strawberry is on the top of my list of favorite flavors, right along with anything chocolate/peanut butter. But anyway, enough about my fascination. I bought this wonderful book full of great cakes that has this lovely recipe for a white chocolate strawberry cake and I knew I had to try it. Of course, I have had the book for over a year and haven't baked a single thing from it but that's not important. The book, Cake Keeper Cakes by Lauren Chattman is worth it if you like snacking cakes (it is the best way to describe it). Think pound, loaf, bundt or crumb type of cakes. No stack cakes covered in icing in this book. The types of cake you can have for breakfast or a snack or with some tea or coffee without the guilt (or something like that). I may not know what I am talking about since we never have guilt when it comes to cake, in any shape or form in this house. Now onto this cake, it was delicious. Sweet, but not to sweet. Moist and flavorful. I had some strawberry in every bite. Totally worth making at least once. I doubt it will last long if you do. Here is the original recipe and my changes are at the end. Combine the egg, egg yolk, sour cream, lemon zest and vanilla in a measuring cup or bowl and mix the ingredients together and set aside. Combine 1 1/4 cups flour , baking powder, baking soda and salt into a bowl. Whisk together and set aside. Beat the butter and sugar together with a mixer on medium/high speed until combined and light and fluffy. Turn the mixer to medium/low speed and slowly pour the egg/sour cream mixture into the bowl. Make sure to scrap down the sides of the bowl as needed. Then slowly add the flour mixture, 1/2 cup at a time until all of the mixture is combined making sure to keep the mixer on 30 seconds after the last addition. Make sure to scrap down the sides of the bowl as needed to make sure all of the ingredients are mixed thoroughly. Toss the strawberries with the remaining 1/4 cup flour and add to the mixture along with the white chocolate chips. Slowly mixing them with a spatula. Pour the batter into the pan and cook for 45-50 minutes. My cake was done at around 35-40 mark so just start watching it around 30 minutes. I added a little more than 1/2 cup of sour cream. I am not sure if by adding the extra ingredients if it changed the moistness of the cake or not but this cake came out perfect for me. 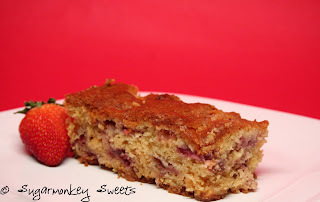 Whatever you do, make sure to go buy some strawberries or go pick some and make this cake. You will not regret it. Life doesn't seem that interesting and depression, the deep, dark depression that can easily take over is just to much while trying to keep living life. I didn't have time to really think about how I felt while my dad was sick and after he passed away, the emotions took me over from every direction. The last six weeks has been filled with lots of tears, sadness, depression along with laughter and happiness. I will always miss my dad. I love him dearly. He was such a big part of my life that it is hard to not have him here, just a phone call/short drive away. It is a slow process and things are getting better everyday. I am trying to get back to the things that make me happy and baking always made me happy. Everyone loves a good cupcake, right? I am kicking off my return with these rich and indulgent cupcakes. 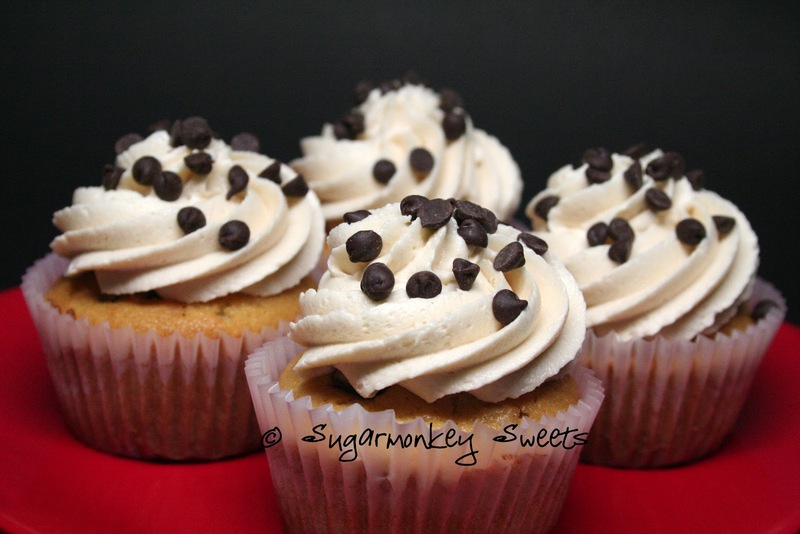 These cupcakes are just like a chocolate chip cookie. Okay, a soft, gooey cookie with butter frosting on top. They remind me of better, happier times. Times when there was less pain and life was good. Oh the chocolate chip cookie cupcake, how I love you. 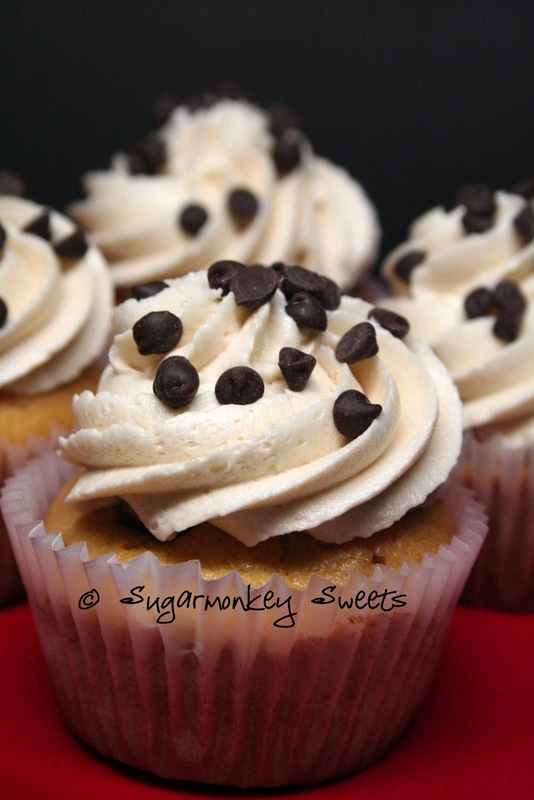 These are the kind of cupcakes you serve to the true sugar lover in your life. Incredibly sweet, buttery goodness that will bring a smile to your face and an intense sugar rush. I adapted my cupcakes from Annie's Eats. Please kick on the link for her recipe. I didn't do the cookie dough filling but you might want to give it a try. Stay tune for more sugary goodness. I would love to be able to bake and post pictures of my baked goods however, my dad has leukemia and I have been taking care of him which is why I have been absent for so long. I hope when things get a little more stable I will be back in the kitchen and sharing with you guys. I love this time of year - the weather, the baking, the holidays. This is when baking is appreciated as everyone wants to know what you are making for Thanksgiving or giving away for Christmas. I also don't think people really diet during this time either, which is good for me. Preheat oven to 350 degrees and line a 9x13 pan with aluminum foil and spray with non stick cooking spray. Whisk together all of the dry ingredients in a separate bowl and set aside. Using a stand mixer, beat the butter and sugar until incorporated and smooth. Add the eggs, pumpkin and water. Slowly add the dry ingredients, scraping down the sides of the bowl to make sure all of the ingredients are mixed well. Spread about 2/3 of the mixture into the pan. 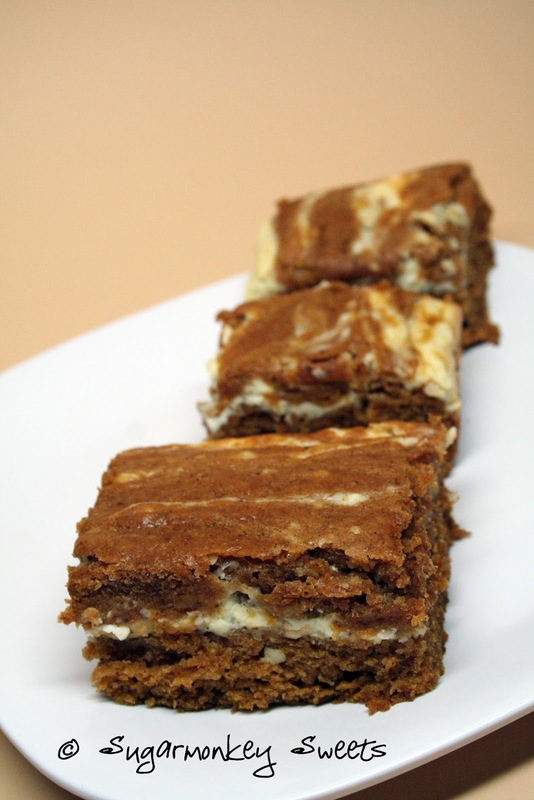 Using a stand mixer, cream the cream cheese and sugar together. Add the vanilla and egg, mixing until smooth. Scoop out the cream cheese mixture on top of the pumpkin mixture. I smoothed the cream cheese layer out a little bit before adding the remaining pumpkin mixture on top of the cream cheese layer. Then use a knife or spatula to swirl the mixture together. Bake for 30 minutes or until middle is set. Enjoy! I kept it simple for the holiday. 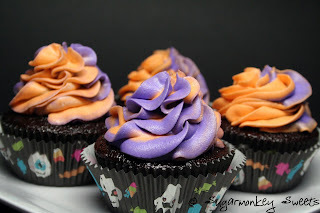 I made chocolate cupcakes with purple/orange swirled icing on top. 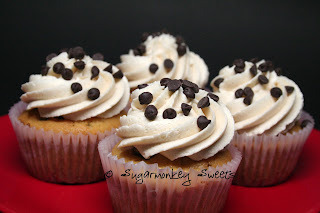 I used the left over batter from my s'more cupcakes that I made previously and frozen. The wrappers are from Target. The buttercream recipe is below. Using a stand mixer, cream Crisco and the butter together . Make sure to scrap down the sides of the bowl. Add the vanilla extract and slowly add the powdered sugar. Once the powdered sugar is mixed together add the dash of salt and add as much of the milk/water to get a nice smooth consistency. Color and frost cupcakes as you desire. Since this is a crusting buttercream, make sure to cover the bowl with plastic wrap or put in a container with a lid if not using the icing right away. For about a week we had nice fall weather and what better way to celebrate the the cooler weather than with some s'mores. 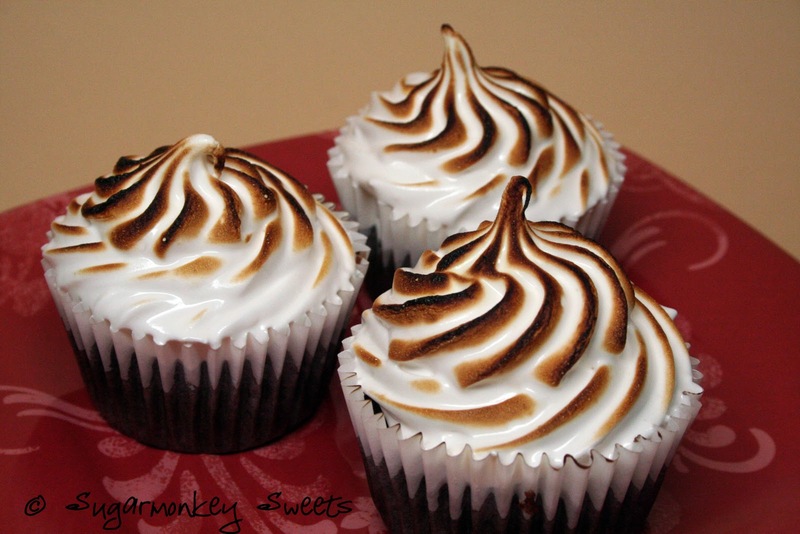 I admit that other than the nice cool weather, I wanted to try out my new kitchen torch so these cupcakes were a must. These cupcakes were fun to make and incredibly gooey to eat. Everyone loved them and I can see making these again with some slight changes (see notes section).. Eating them with a fork is totally acceptable, at least in my house to limit getting frosting all over your face and hands. Using a food processor or bag/rolling pin method, crush the graha m crackers and put into bowl. Add the sugar, melted butter and mix well. Scoop 1 tablespoons to 1.5 tablespoons of graham cracker mixture into prepared cupcake pan and press the mixture down to form a crust (the bottom of a squeeze bottle works well for this). Chop the bittersweet chocolate very finely and sprinkle a little into each cup, on top of the graham cracker crust. Bake for 5 minutes then put on a cooling rack to cool whole making the cupcake batter. Put all of the dry ingredients into bowl of mixer and mix until incorporated or you can whisk the dry ingredients together if you don't have a stand mixer. Whisk together the wet ingredients except the boiling water together in a separate bowl and slowly add to the dry ingredients. Mix together, stopping once to scrap down the sides of the bowl. Slowly add the boiling water and mix until just combined. Scoop the batter onto the top of the graham cracker crusts, making sure to fill the cups 3/4 full. Bake for 15-20 minutes, until cupcakes are done. Add the egg whites, sugar and cream of tartar to your mixer bowl and place on top of a pot of boiling water. Place a candy thermometer into the bowl. Whisk the mixture until the the temperature reads 160 degrees. Using the whisk attachment, mix the mixture until stiff peaks form (several minutes) and add the vanilla extract. 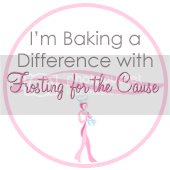 Frost the cupcakes anyway you choose and either use a kitchen torch or your ovens boiler to toast the frosting. graham cracker bottom but still delicious. The chocolate batter didn't rise as much so make sure to fill these up to the recommended 3/4 cup full. Don't be shy with toasting the frosting. The general consensus was that I could have toasted the frosting a lot more. The cupcakes could have done with less frosting but you know, I personally love a lot of frosting. 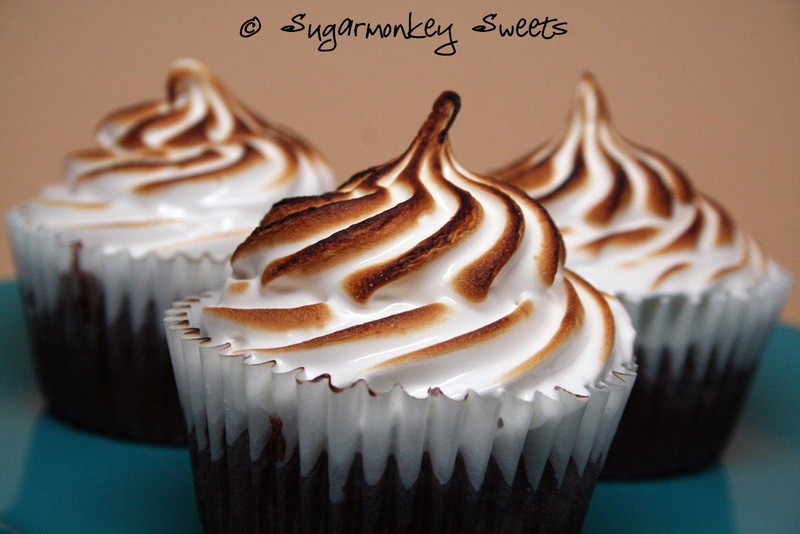 Copyright Sugarmonkey Sweets. Powered by Blogger.